How do K-12 students benefit from a visit to the Clarence R. Smith Mineral Museum? The Ohio Department of Education publishes learning standards for each subject area which are categorized by grade level and assessed through annual state tests. Click Here to learn more about the ODE’s learning standards and state tests. There are several K-12 Earth and Space Science (ESS), Physical Science (PS), and Life Science (LS) learning standards which are both directly and indirectly applicable to content in the Clarence R. Smith Mineral Museum. Click Here for a pdf of the 2018 Ohio Learning Standards for Science. Due to space limitations, please notify the museum of your field trip or group tour intentions by clicking on the Tour Request Form below. 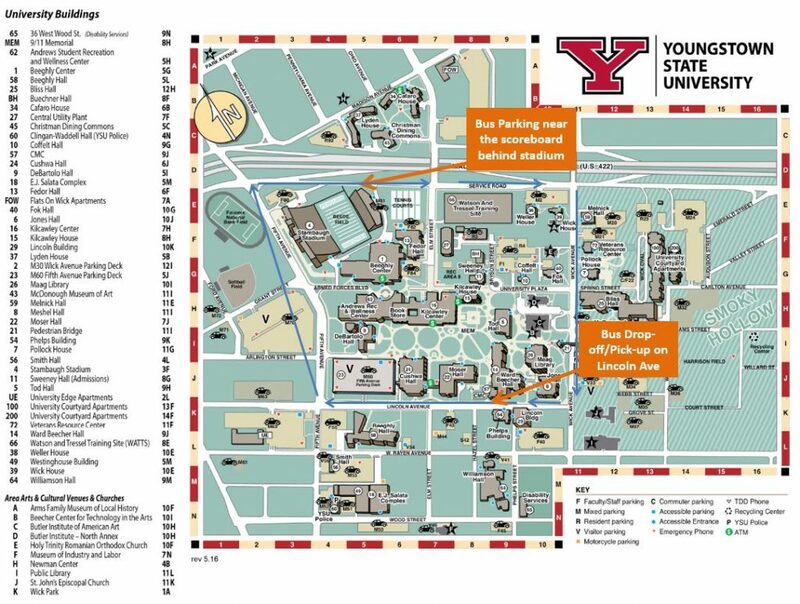 Instruct bus drivers to travel westbound on Lincoln Avenue and drop off students or groups at the designated unloading area in front of Moser Hall. This area may also be used for picking up your group once you are finished on campus. Buses are able to park by the stadium scoreboard. Please refer to the image below for a bus route (indicated by blue arrows) around campus.